PA news agency reports that the team for negotiations with Israel has resigned, but senior official denies the report. The Palestinian Authority’s team for negotiations with Israel resigned on Thursday, the Ma’an news agency reports. According to the report, negotiators Saeb Erekat and Mohammed Shtayyeh presented their resignation to Palestinian Authority Chairman Mahmoud Abbas. Informed sources said that the resignation came in protest of Israel's “non-compliance” with the PA’s demands, as well as its decision to promote new construction in Judea, Samaria and Jerusalem. The negotiators' bid for resignation can be either accepted or rejected by Abbas, who called for a PLO Executive Committee meeting to discuss the issue as soon as possible, according to Ma’an. A senior PA official, however, denied the reports of the resignation, according to AFP. "The Palestinian leadership will take a number of steps in the next few days to face the settlement offensive," the Palestine Liberation Organization's executive said after the meeting, AFP reported. The PA has been critical of Israel’s announcement that it plans to build 1,500 new homes in the Jerusalem neighborhood of Ramat Shlomo, often erroneously described by anti-Israeli media as an "illegal settlement in east Jerusalem". On Wednesday, a spokesman for Abbas, Nabil Abu Rudeina, said Israel’s move "destroys the peace process and is a message to the international community that Israel is a country that does not respect international law." Plans to build the homes in Ramat Shlomo were made public almost immediately after Israel freed 26 terrorist murderers as a “gesture” to Abbas in order to continue the renewed peace talks. The PA was informed prior to the latest round of talks that Israel will continue to build in areas which even the PA has accepted in previous negotiations will be within Israeli borders. 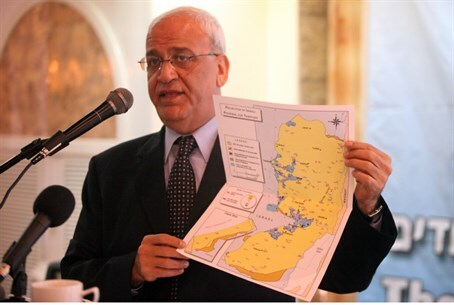 Nevertheless, Palestinian Authority officials and their supporters have expressed outrage at Israeli plans to build.